While my fiber art projects continue to call to me, I've had to move outside to more earthy endeavours. It's finally warming and the lawns and trees are greening up. There is always lots to do outside this time of year and this year more so because I now have a lovely raised bed to plant. I filled it with veggie seeds this morning. Also, last year, hubby expanded the deck which meant that I lost the nice veggie patch that I had going all round the base of it. I'm working on hoeing up a new space that I'll use for climbing veggies as I have three metal trellises. It's all about making good use of every little sunny spot. Things are pretty plain at the moment but it won't take long for the foliage and flowers to fill it all in. This afternoon I went out again to move a few perennials and make space for one of the really big hostas that a friend gave me. Whenever come in for a break, I grab a bite and some tea and flop with my knitting. I'm really liking how the baby afghan is looking with the yarn that I unravelled from the sweater I didn't like. I'm using some other cottons from my stash for the stripes. 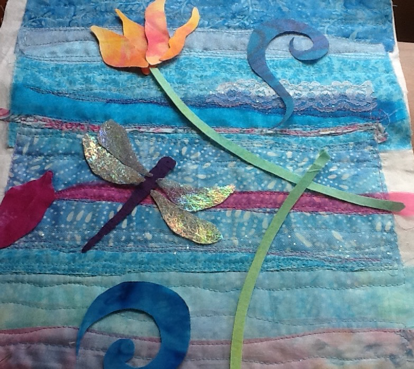 Yesterday, I only ventured into my sewing studio long enough to re do the dragonfly wings. The bottom layer is a sparkly black tulle to which I added (with Lite Steam a seam 2) a thin sprinkle of Angelina fibres. I'm satisfied with them now. It'll be a rainy day endeavour. It won't be long either before the heat will be too much for me and the sewing studio will be my retreat with a great view of the garden. I'm wishing you all a lovel Monday in your part of the world. On Monday morning I woke up with a gastro-intestinal bug which has kept me home and lolling about for the last several days. 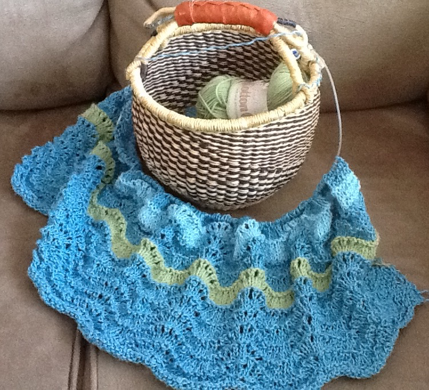 I retreated to the sofa, watched a few PVR'd shows, and caught up with some unfinished knitting projects. By the way, have you seen the show on PBS, Call the Midwife? I've just discovered it and I'm hooked after the first two shows. I accomplished a few things while lying about. I unravelled a sweater that I had almost finished but didn't like, sewed in the ends on a baby sweater, started a new pair of socks, and finally, I tried out several patterns using the cotton yarn from the sweater. I settled on a knitted feather and fan pattern in a baby sized afghan. After finishing a pair of socks, I started another pair. I always like to have a pair on the needles for times when I need something mindless to keep my fingers busy. Today, I knew i was recuperated and my creative spirit was rising while at breakfast I had the urge to sketch the dogwood branch with the catkins that I brought home form the trail last weekend. And then, for the first time in 4 days, I had the energy to head into my studio for a bit this afternoon. All week, I had been thinking about adding a dragonfly to my tulip piece, something that I often added to my pieces in the past. This is when my specimen gathering and sketching comes in handy. Of course one can always find images on the net, but it's more fun to have them for real. This one has been tacked to my bulletin board in a plastic bag for a while. My husband found it trapped on the grill of our car after a trip a few years ago. The tip of it's tail broke; it's in the bag too. I'm trying out some different fibers for the wings. Above, I added angelina fibers to a sparkly netting. I think I'd like something more translucent and may try just the angelina with stitch. Is it any wonder it takes me so long to finish a piece, when I can spend a couple of days to decide upon dragonfly wings? Every once in a while I stop to gaze out my studio window. 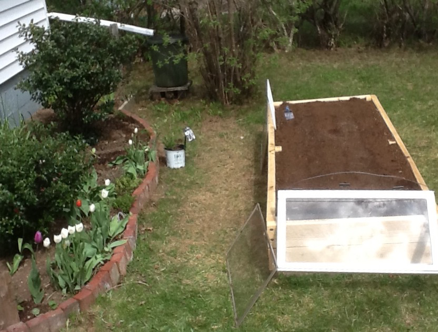 Something added to my view is the raised bed which is about 3 ft by 8 ft that my husband built on the weekend. It is going to be so much easier for me. I'm looking forward to filling it and all my pots with vegetables. Yesterday, was a nice day here, but I did spend part of it at our last guild UFO day where I worked on cutting and sewing a new cover for the deck swing. Later, we had dinner out with family to celebrate the 99th birthday of a great aunt. Before dinner, I went for a short spin on my bike along my usual snowshoe trail. I was able to bike along most of the more open spots except for this section. The leaves are just beginning to bud and the ground cover is still pretty sparse. Spring colors are appearing if one looks carefully. Love the color in this new little fir tree! There are pretty little things. The catkins on the dogwood are open. Today, I spent my short time in my studio happily and mindlessly meandering back and forth on the background piece for the tulips. No matter how I tried, I could not get all the sparkly bits to show. Now, I need to decide how I will applique the tulips.They have fusible on the back but I'm wondering if the color in the background might show through. Also, I would like to have some extending beyond the background edges and I need to think about the best way to do that. Last night, I cut out a few bits of fused fabric tulip shapes to audition on my layered. I was anxious to see how it would work before I continued laying out the background strips. The sun has come out again and plans to stay for a while I believe. The plan is for me to go outside for an hour or so in the morning or until I'm too sore to keep going, come in for lunch along with the application of ice packs, and then I head to my studio for some art play. This morning's task was to finish transplanting my rhubarb further along the fence where it will get more sun. I know it looks pretty blah now but I am so proud of this, lol! It took 2 days and involved digging up the grass and sifting through rocky soil, sieving out what I could get out of the still partly frozen compost bin and adding it to the patch, digging up the rhubarb to move and laying in the brick border; all done gingerly and at a turtles pace, so as not to aggravate the joints. But oh, it is so good to get outdoors and into the dirt! I used the ice packs during lunch and after tea, I m0oved into my studio. I was anxious to lay out more fabrics for my tulip background. What you see below is just an idea of where I will go with it. The orange is brighter in these second two pictures than the first one. After a recent little photography lesson, I m experimenting with new lights. At the moment I'm using natural light and a light on a stand. I have a second light bulb but need another stand. The fused tulips and swirls are laid out to get a feel for the placement and color. I will take them off and stitch down all the layers of background fabric before fusing them on. The plan is for the free motion stitching to enhance the background as well as providing soft transitions between the layers. I picture it as a long narrow piece with some of the tulips extending outside the edges. I got my sample quilt block out of the way yesterday, and cleaned my sewing room already for today. I'm almost finished my surfer and I've got a project that has been floating around in my head that wants out! My art like a lot of peoples, tends to follow the cycles of the seasons and the flora and fauna that populate them. Tulips have been in the stores and are growing in my garden. I can't wait for them to bloom! 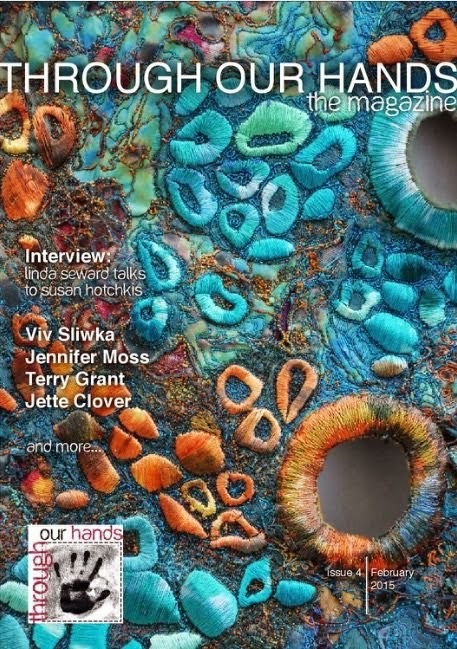 If you look closely on the bottom right, you'll notice the fiber art piece the Wave with the surfer. I really needed to get this concept out of my head and created in fiber fabric! The tulips variety in colors inspired me to pull out some old sketches and some fabrics. I love the purple orange pink combinations. I've started layering some background fabrics--blues at the top going into greens with chiffon layered a top here and there. Underneath is a piece of white fabric over a stiff stabilizer. I plan to do lots of stitching over the background before adding appliqued tulips. I've done similar things before but not a lot and not recently. I needed to do something a little freeing. My sewing room is once again strewn with fabric. We were away on the weekend for my daughter's graduation from UPEI. She had been teaching for 3 and half years in S Korea and really wanted to get her BEd to improve her salary and job prospects. It's not so easy to come home and go back to school at 30. We are so happy for her. She and her boyfriend both graduated from the same class. I think they may stay on the Island for a while to get the experience they need. Already, Caley has been called for 2 substitute days. She has been told that her French will mean she may be in demand. Last Friday, (she had just finished her practicum) she got called for junior high sewing class. And she sews which was another bonus. Apparently a lot of young people don't. We came home very late on Saturday night, so yesterday was a recuperation day. I had a nice visit with a lot of family members and even managed a bit of shopping. Can you believe it, my husband wanted to give me a certificate for a massage; I told him I'd rather have some art supplies. I've been wanting to try gouache paints for a while. I got those along with a couple of soluble pencils and a sketchbook with a cork cover that I could nor resist. And then came home to hear from mu youngest son that he had called in a gift certificate art the local spa for me. Today, I went outside to start a bit of my gardening. We still have one patch of snow and the earth in the compost bin is still frozen-- I managed to get a small load from it for some rhubarb that I transplanted to a sunnier location. After lunch, I ironed some pieces of new fabric that I washed this morning and then I cut and sewed a sample block. A few years ago I collected some fabric and not gotten around to using it. I'm thinking that my mom might like it even though I've already done one for her. 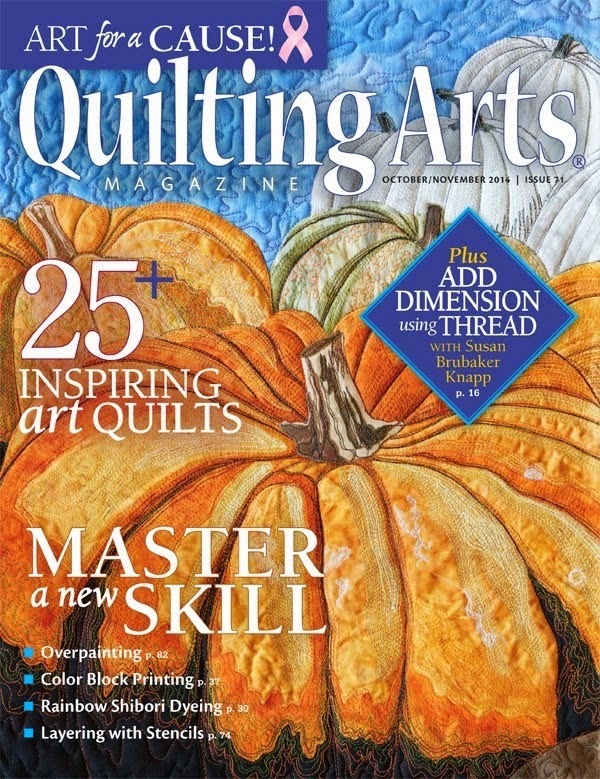 I'll likely leave it packed up for my guild quilting days next fall. I like to work on my fiber art most days here at home, but once in a while I like a little easy diversion and today was one of those days. It measures about 12 1/4". I have a few different prints in the line which I will use in the 2 largest sections. The square and the thinner strip will be blues and greens. I haven't been here much lately. My head has been totally into it- -I'm even planning my next piece-- but my body was not cooperating. 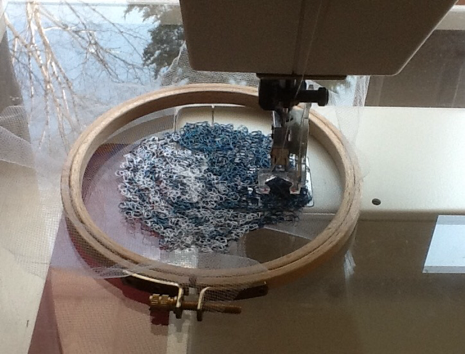 For several days this week, I fell asleep after my lunch-- my sewing time. I was wondering just what was going on but a call to my pharmacist solved it. I've been weaning off a medication that I had to take in increasing amounts last year when I developed a weird neuropathy (we've never gotten to the bottom of that either). When I described my symptoms, he told me it was definitely withdrawal. I can only decrease by a small amount per week as recommended, so I have to be patient. Today, I avoided the nap at least and managed some stitching. I've got most of the background done except for a bit in the water at the bottom. I wasn't sure about the spray, but I think it works now that I see it on the screen. Also, I preferred the first bit of plain white thread lace that I made; I need to make more to finish across the top of the wave and around the surfer. There's a bit of a problem with some puckering in the sky which I'll give some thought to. It occurred to me that I could carefully snip it away from the trees and carefully restitch it, tucking it under when I add the batting. I have to practice what I preach. I always tell people there are no mistakes, just 'happy accidents'. Creative solutions can be found eventually. Some take longer. We are leaving tomorrow for PEI where my daughter is graduating from the Bachelor of Education program on Saturday. she is 30 and has waited a while to achieve this goal, having taught in Korea for almost 4 years. We're pretty happy. It also happens that much of my family live on th4e island and so it will be a nice reunion. It's only about a four hour drive but we don't usually go in the winter. I'm wishing you all a nice weekend. I''ll be back home and back here by early next week. I know I've been neglectful of my presence here. It is not that I have been too busy although there are a few more things to do in the yard with the at long last warmer spring weather. I can't work for too long, dividing up chores into little bits like unwrapping two trees and picking up a few twigs each day. My fiber Art pieces are always on my mind. I'm often let in a dream state thinking about how next to approach a section. I'm just going through a bit of a lull in my energy. One must go with the flow. 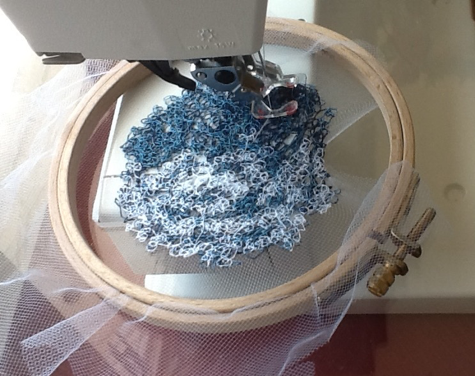 And so, I sat down for a few minutes at my machine to free motion stitch more white frothy thread lace that I want to use for the top of the wave. I did make some lace last week, but then thought it might need some darker under shadows for dimension. Not sure about it, we'll see. Can you see the birch trees outside my window that are reflected in the glass insert below? It's only a tiny bit of work but at least I feel like I did something! 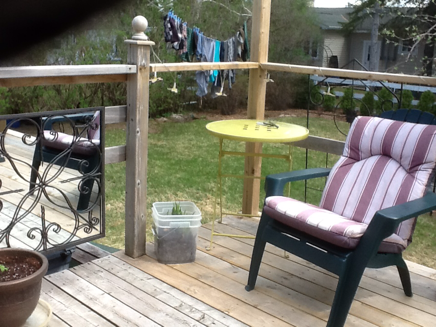 Now, I'm going to make a cup of tea to take out onto the sunny deck. It's finally warm enough.